The lost of De La Salle-College of Saint Benilde (DLS-CSB) student Guillo Servando is one of the most sensational topics in the Philippine news today. 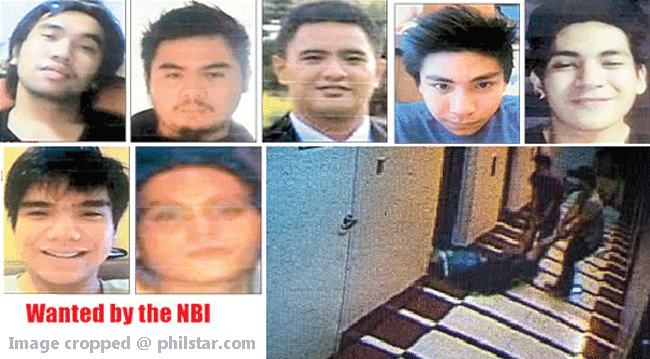 Because of this, the National Bureau of Investigation (NBI) and Manila Police District (MPD) investigators are doing their best in order to find the suspects who appeared on the CCTV camera footage released. Recently, one of the suspects which is a member of the Tau Gamma Phi fraternity surrendered and now is in the custody of the Department of Justice. He is not identified yet and there is a possibility that he will become a witness. Once the fourth victim of the hazing and the minor who survived it will appear, the case will be filed against the suspect. This is according to Senior Police Officer 1 Danilo Sadsad. The family of the victim who died is crying for justice on what happened to their member. There are allegedly 13 suspects for the hazing and they are being traced based on the statement of Raval who is a witness. He recalled what he could possibly remember and according to him, he, Servando and the minor met with Tau Gamma Phi – College of St. Benilde chapter members in a certain fastfood chain at around noontime until 5:30 PM and then headed to 454 Calatagan St. in Barangay Palanan. It was the place where the initiation rite was done that caused loss if life of one of them. A further investigation is still being conducted on the issue. This news was based on Philstar News.